A&B Barns is known for beautiful and functional New England style barns and exceptional customer service. We have been combining style, quality and function with custom-designed Stall Barns and Indoor Riding Arenas for over 40 years. 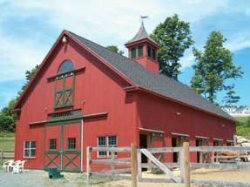 Whether you’re looking for a small barn for your backyard, a commercial equine facility or something in-between, A&B Barns can help you build your dream. Our experienced salesmen and CADD department can add the details to make your barn unique. We understand the special requirements of the equine world and work with you to meet your specific needs. We’ll walk you through the initial planning process, reviewing details from floor plans and framing to paint/stain colors. Offering many material options to meet your needs and budget, we can also provide stall components including standard or custom-built sliding doors, dutch doors, windows and grilles. Our detailed plans, stamped by an engineer, along with our expertise, can help you through the permitting process. We will work with your builder, or, if you prefer, provide you with a reference for a reputable builder. We will be by your side from start to finish. Although known for our stall barns and arenas, we also design run-in sheds, garages, storage buildings and barns for a variety of use. A&B Barns is a Division of Belletetes, Inc., offering an even greater selection of materials and resources to make your dream a reality. Start planning your dream today, contact Betsy Bryant at 1-800-267-0506. Check out the photo gallery to see pictures of our arena, stall barns, garages, storage building and cupolas.